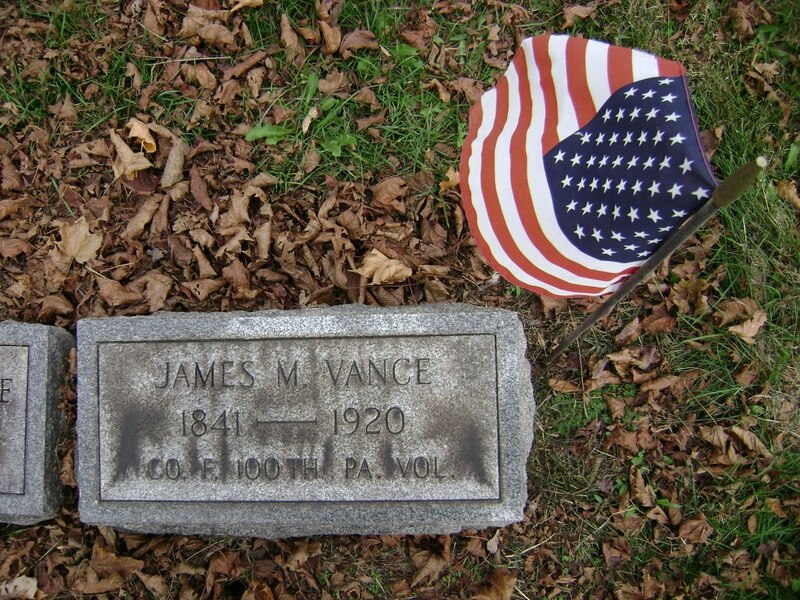 Vance, James M. F 20 fair 5' 6" grey light farmer Penna. June 11, 1841 17-Feb-1920 New Castle PA X not found Per ACWRD, buried in Oak Park Cemetery, New Castle, PA; wounded in the leg at Spottsylvania CH, VA, May 12, 1864. Vanhorn, William B 26 New Wilmington, Pa. Richmond VA Not found No other ACWRD info found. Vankirk, George W. D 25 carpenter Beaver Co. Phillipsburg PA 1831 1881 Beaver Co. PA 69395796 widow Agnes in 1890 census; wife Agnes on findagrave info--same individual. Vankirk, William D 31 carpenter Beaver Co. Darlington PA Darlington, PA March 2, 1835 27-Oct-1917 Lisbon PA X 62114351 Per ACWRD, birth info. Buried: Kirksville,MO; ACWRD has his last name spelling as Vaghn. Possible caretaker of Lt. Applegate's widow Susan? Vogan, George J. G 20 May 12, 1864 Spottsylvania CH VA Not found On 8/30/1861 he mustered into "G" Co.
Vogan, Irester K 17 New Castle, PA March 23, 1846 July 12, 1864 Lawrence Co. PA X 16060510 On 2/28/1864 he mustered into "K" Co. He died of wounds on 7/12/1864 at Lawrence County, PA; (Died at his home); He was listed as: * Wounded 6/2/1864 Cold Harbor, VA; Other Information: born 3/23/1846 in New Castle, Lawrence Co; Name is "Ivester". Vogan, John A. C 21 fair 6' 2" grey light farmer Butler Co., Muddy Creek PA Worth Twp, Butler Co.PA April 13, 1841 July 5, 1894 Prospect PA not found X Listed as wounded at Spottsylvania CH per ACWRD; also birth location and date.